The line support used for transmission and distribution of electric power are of various types including wooden poles, steel poles, R.C.C. poles and lattice steel towers. The choice of supporting structure for a particular case depends upon the line span, X-sectional area, line voltage, cost and local conditibns. 1.Wooden poles: These are made of seasoned wood (sal or chir) and are suitable for lines of moderate X-sectional area and of relatively shorter spans, say upto 50 metres. Such supports are cheap, easily available, provide insulating properties and, therefore, are widely used for distribution purposes in rural areas as an economical proposition The wooden poles generally tend to rot below the ground level, causing foundation failure. In order to prevent this, the portion of the pole below the ground level is impregnated with preservative compounds like creosote oil. 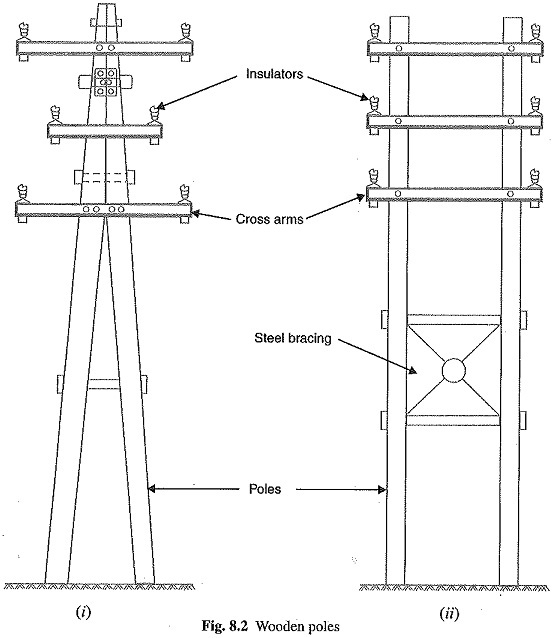 Double pole structures of the ‘A’ or ‘H’ type are often used (See Fig. 8.2) to obtain a higher transverse strength than could be economically provided by means of single poles. 3.RCC poles: The reinforced concrete poles have become very popular as line support in recent years. They have greater mechanical strength, longer life and permit longer spans than steel Moreover, they give good outlook, require little maintenance and have good insulating prop­erties. Fig. 8.3 shows R.C.C. poles for single and double circuit. The holes in the poles facilitate the climbing of poles and at the same time reduce the weight of line support. The main difficulty with the use of these poles is the high cost of transport owing to their heavy weight. Therefore, such poles are often manufactured at the site in order to avoid heavy cost of transportation. 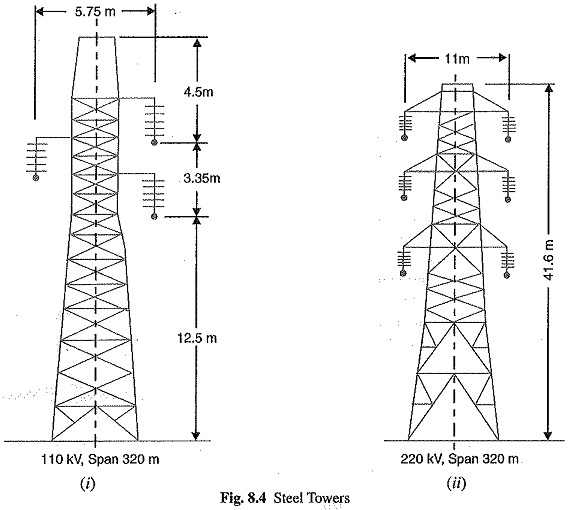 4.Steel towers: In practice, wooden, steel and reinforced concrete poles are used for distribution purposes at low voltages, say upto 11 kV. However, for long distance transmission at higher voltage, steel towers are invariably employed. Steel towers have greater mechanical strength, longer life, can withstand most severe climatic conditions and permit the use of longer spans. The risk of interrupted service due to broken or punctured insulation is considerably reduced owing to longer spans. Tower footings are usually grounded by driving rods into the earth. This minimizes the lightning troubles as each tower acts as a lightning conductor. Fig. 8.4 (i) shows a single circuit tower. 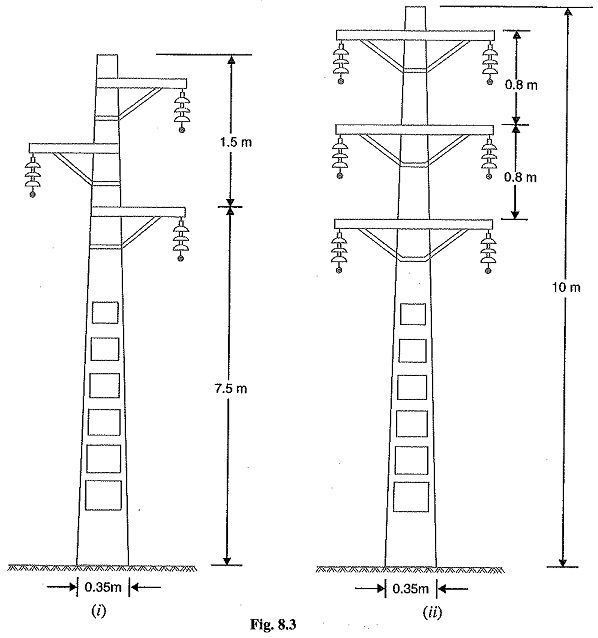 However, at a moderate additional cost, double circuit tower can be provided as shown in Fig. 8.4 (ii). The double circuit has the advantage that it ensures continuity of supply. It case there is breakdown of one circuit, the continuity of supply can be main­tained by the other circuit.